With his striking exterior and three fantastic gaits, this fabulous stallion impressed the entire European equestrian world. 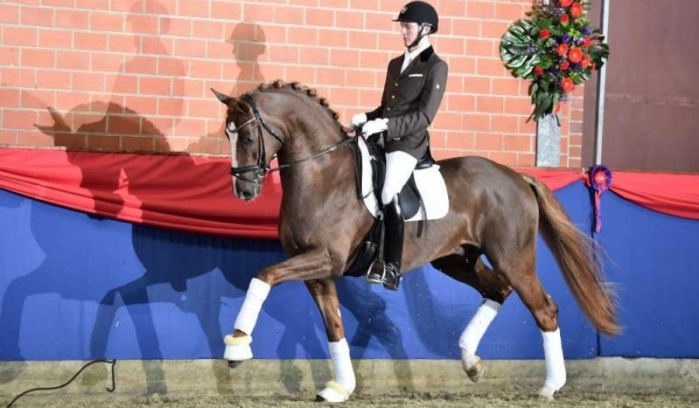 Don Deluxe was sovereign champion stallion in Oldenburg 2013 and in 2015; he won the Danish Warmblood 35-days performance test. His sire, De Niro, number one on the WBFSH dressage sire ranking, has sired a number of licensed sons before Don Deluxe. The dam line includes the famous Egitta-line, counting numerous licensed stallions and highly prized mares as well as international competition horses. As a result, we have great expectations to the offspring by Don Deluxe. The grand sire, Rosario, by legendary Rubinstein, was premium stallion in Vechta in 2001. He won his performance test, was nominated "Oldenburger Champion" two years in a row and "Vice-Bundes Champion" in Warendorf. In addition, he qualified for WCYH in Verden and in 2003; he was nominated "reserve champion" and later followed excellent results in S-dressage. In third generation, you find Feiner Stern, who was champion stallion with exceptional trot capacity. The exceptional Don Deluxe has inherited the top exterior and gaits from his traditional bloodlines. Don Deluxe is licensed in Oldenburger Verband, Hannoverian and Danish Warmblood. Don Deluxe is stationed at Helgstrand Germany in Hagen.